Emotionally uplifting, helpful when worried and beneficial for digestion. This is our cardamom essential oil.. We have two Cardamoms here at Stillpoint. An essential oil and a Cardamom Co2 select extract. The main difference between Cardamom essential oil and the CO2 extract is the process of extraction. The essential oil is steam or hydro distilled, while the CO2 extract is extracted by using carbon dioxide gas and a low pressure. They also vary a bit chemically, not too much though. The aroma of the Cardamom steam distilled essential oil is a bit lighter in its a aroma. Tip: If something is referred to as an essential oil, this tells you that it has been steam or hydro distilled. If it is referred to as a CO2 total or select or supercritical, this this tells you that it has been extracted by Carbon Dioxide gas. The analogy we like to use is that the steam distilled cardamom is like a light beer and the co2 extract is a deep stout. • In baked goods such as breads, cookies or a muffin recipe. Small Cardamom or True Cardamom (Elettaria cardamomum) is a member of the Ginger family (Zingiberaceae). It grows wild in the monsoon forests of South India and Sri Lanka. It is cultivated extensively in these countries, as well as in Guatemala and elsewhere. Energetically and emotionally, Cardamom essential oil just like the Co2 is stabilizing for the emotional and mental bodies. Because it is extracted from a seed, it offers a level of nurturing and protection when used in blends. It has also been known to be a wonderful aphrodisiac. Cardamom adds sweetness and hope to depressive situation. There is a completeness and gentleness that is within this extract. Because this extract offers you the “whole seed,” if you want to add this kind of “wholeness” to any blend, try using Cardamom CO2 extract. It helps people that are burdened with worries and and events that test our ability to endure. According to Madeleine Hayes, cardamom can help people that are "cold to the core"
Cardamom is known to be the Queen of Spices, one of the oldest spices used for thousands and thousands of years. It is thought to be brought to Europe by the Greeks in the 4th century BC. 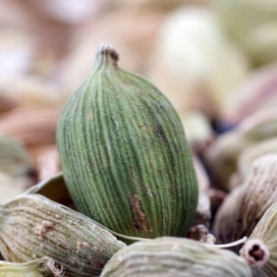 It is believed that the name cardamom comes from the Arab word hehmama - a Sanskrit term meaning hot and pungent. Chemically this Cardamom extract has a good amount of 1,8 cineole and and also terpynal acetate. The cineole is an oxide, which makes this extract great for the respiratory system and also great for the clarity of the mind. The acetate is an ester and that makes the extract a great anti spasmodic for the digestive, respiratory and muscular system. According to Tisserand & Young, oils high in 1,8 cineole can cause CNS and breathing problem in young children. Do not apply to or near the face of infants or children.